Got bored of looking at routine desktop wallpapers on your system? Want to change it, animate it, redesign it, recolor it? DeskScapes brings your wallpaper to life. Using DeskScapes you can create animated wallpapers with real-time effects. 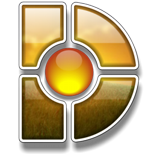 DeskScapes uses Windows Vista's 3D hardware acceleration software to produce fresh and photorealistic images or wallpapers in the .Dream file extension. There are many tools that can create animated and special effects to images, but DeskScapes does it better than any other application. Find out what DeskScapes can do? You can generate animated wallpapers for your Windows Desktop. Supports the use of .DREAM files, WMV and MPEG videos to produce animated ones. Even a person who doesn't know how to use 3D applications can produce simple and innovative animated images. You must save in .dream format inorder to apply to your desktop. Apply over 40 effects to your wallpaper like image blur, black & white, inverted, canvas texture, right vision, pop art, sepia, animated snow and many more. Strech image or video which fits the resolution of your system monitor. With Random wallpaper option, for every day, hour or 10 minutes, a new(random) wallpaper is shown without you manually changing it. A tabbed section will help you to create and apply effects to wallpapers of your choice, easily. A large preview area will assist you to look at how the desktop is going to be before applying the effects. You can download DeskScapes for free. But with a premium version of DeskScapes, you can get upgrade to Object Desktop which can offer more tools and options if you are an experienced user. 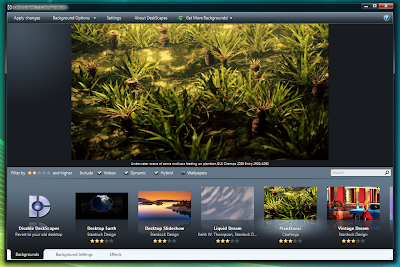 DeskScapes is supported in Windows platforms like Xp, Vista and 7.